Several adventure cruise lines offer seasonal voyages to the otherwise inaccessible reaches of South America, but Cruceros Australis has specialized in sustainable scientific cruises to this region since 1980 (with a maritime history dating back nearly 100 years). To celebrate its 20th anniversary, the cruise line is launching a third vessel, the 210-passenger Stella Australis which will sail its maiden voyage through Patagonia on December 18. As the largest ship in the fleet, Stella Australis will boast three lounges, a game room, and ? for guests who can muster up enough discipline to work out on a cruise vacation ? a glass-paneled gym with sweeping views of the passing surroundings. On four-night cruises, the Stella Australis will embark from Punta Arenas, Chile and will coast through the Beagle Channel and the Strait of Magellan. Each day, zodiac boats carry passengers to shore on guided excursions to penguin colonies, glaciers, and national parks. Guests will also visit Wulaia Bay, the area where Charles Darwin landed in 1833 during his famous world voyage aboard the HMS Beagle, prior to writing the “Origin of Species.” All excursions are included in the cost of the cruise, as well as onboard nature presentations from the ship’s expedition team (who report photographs and scientific findings to the Center of Quaternary Studies Fuego-Patagonia and Antarctica). The Stella Australis travels as far south as Cape Horn before concluding in Ushuaia, Argentina ? the gateway to Antarctica. Unlike many cruise lines, I have to give Australis credit for keeping the Stella's rates at the same level as the rest of its fleet – despite the vessel being fresh off the shipyard. (However, the sporadic promotional departures do not apply to the new ship.) During low season (December, late March, and April), you can snag a four-night cruise for $1,400/person. During the high-season (January through early March), rates jump to $1,770/person. Three-night cruises are also available. For more information, visit www.australis.com. Several adventure cruise lines offer seasonal voyages to the otherwise inaccessible reaches of South America, but Cruceros Australis has specialized in sustainable scientific cruises to this region since 1980 (with a maritime history dating back nearly 100 years). 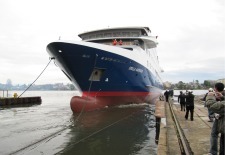 To celebrate its 20th anniversary, the cruise line is launching a third vessel, the 210-passenger Stella Australis which will sail its maiden voyage through Patagonia on December 18. As the largest ship in the fleet, Stella Australis will boast three lounges, a game room, and ? for guests with can muster up enough discipline to work out on a cruise vacation ? a glass-paneled gym with sweeping views of the passing surroundings. Quaternary Studies Fuego-Patagonia and Antarctica).